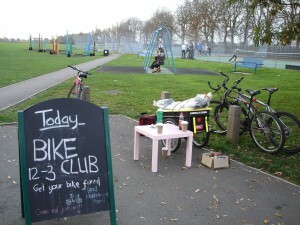 Our Saturday afternoon workshop is at King’s Field in Hampton Wick next to Bushy Park. The Richmond Youth Partnership recently won funding to run a bike club at their cafe in the park – the KCafe – and they chose The Turning Hub to run the club on their behalf . We are starting with some free maintenance sessions which will be open to the general public. Come along, learn how to fix your bike, drink coffee and watch the skaters and BMXers use the skate park. This entry was posted in Events, Maintenance Workshop and tagged Kcafe, Maintenance Workshop by admin. Bookmark the permalink.